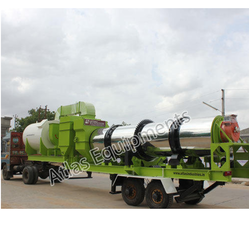 Atlas is India based leading manufacturer and exporter of Asphalt plants. 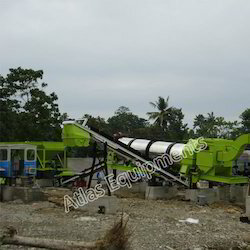 We have different types and sizes of asphalt plants for different customer requirements. Each of this equipment is crafted with due care ensuring that the equipment last for years. Installation and operator training support is provided for the machines that we sell because it is important that customers should be able to make full use of the equipment to maximize the profits. Mobile asphalt drum mix plant is best road making machine for those road contractors who want to have high producton of hot mix asphalt and also want an equipment which is high on mobility factor. There are many situations where frequent shifting of sites is required and this mobile asphalt plant is the ultimate solution at a reasonable rate. Generator space can be set in the chassis for maximum mobility. Tower unit consists of three main components stacked one above the other they are (from top to bottom): vibrating screen, hot bins and mixing unit. Extremely durable and rugged machine. Fast installation and commissioning time. Tried and tested design offers low maintenance. Low cost of spare parts ensure peace of mind. Easy to use and advanced PLC control panel. It is an ideal equipment for customers that are looking to purchase a decent machine without spending excess money and getting fooled. You can expect better performance and durability with this equipment. The standard plant is available with wet scrubber type pollution control device as secondary pollution control unit. This pollution control unit of the stationary asphalt drum mixer works well with dry dust collector to trap all the dust. The drying and mixing drum is coated with stainless steel after covering with cera wool (1206 degrees Celsius resistant) to help retain maximum heat in the drum chamber. Each and every component is crafted with due care to ensure maximum life. 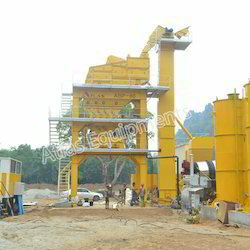 Looking for Asphalt plant ?